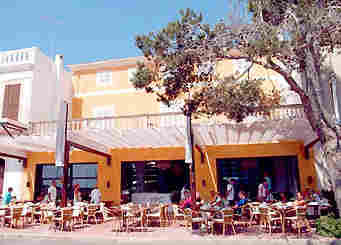 This charming hostel is set in Portocolom on the picturesque island of Mallorca. Enjoying a privileged location and overlooking the Bay of Portocolom, this wonderful property is an affordable gateway for couples, families and groups of friends. Set within 65 kilometres east from Palma de Mallorca and less than 25 kilometres south from Manacor, this lovely establishment is a perfect base to explore the island. The guest rooms are delightfully appointed, featuring cosy furniture and relaxing natural hues. All the rooms come complete with en-suite bathroom and modern amenities. Guests will have the opportunity to taste flavourful regional specialities and international cuisine in charming ambience of the on-site restaurant enjoying panoramic views over the bay. This lovely establishment also offers a cosy cocktail bar in an atmosphere evocative of the sea.